Word has been received of the death of Jeff Alexander, grandson of former Grace Brethren pastor and wife, Galen and Kathern Lingenfelter. He was badly burned when his house exploded on June 10 from a gas leak. “For 6 weeks Jeff and his Stephanie fought for his survival. He was determined to heal. His battle ended on July 23, 2016, at 3:25 pm Mtn time. The trauma that he endured was more than what his body could handle. There were complications internally that were preventing proper circulation of blood flow which was causing internal organs to shut down/die. After 5 1/2 weeks of advocating for Jeff and giving him the chance to heal, the point came were it was out of our hands. The family came to the decision that what was best was to give Jeff back to God and remove the life support. Hours later, Jeff was reunited with his grandparents. We all deeply miss him but are thankful he is no longer suffering here. He was surrounded by family when he went to Jesus. 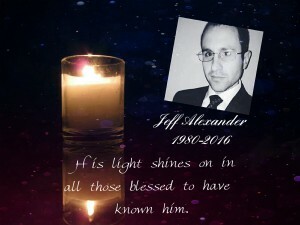 We are grateful that we were given the chance to remind Jeff how much we loved him and how proud we are of a that he accomplished on his journey here. I am grateful that he was not alone when he cross that threshold. An obituary will be available later when plans for a memorial service are announced. Galen Lingenfelter pastored Grace Brethren congregations in Buena Vista, Va.; Elyria, Ohio; and Fort Wayne, Ind. Jeff is the son of Charlene (Lingenfelter) Alexander and the late Thomas Alexander. See also Galen Lingenfelter Grandson Being Treated for Burns.